Tucker Waud has been diving since 1999 - he comes from a family of divers, and was certified at the age of 12. Originally from Chicago, he first went diving on family vacation and fell in love with it. He has dived in Lake Superior; St Louis, where there's an abandoned lead mine; and numerous other places. It is very real to him what divers want from their dives, and what they need. Tucker managed the shop for 2 years before purchasing it last year, with a real vision of where he wants to take it. The Dive Center has been a great resource for local divers since 2012 when the previous owners opened it, and Tucker is looking build on that, and make it even more valuable to the diving community. They provide diving services, rental equipment, retail equipment, training, equipment service, and dive trips. 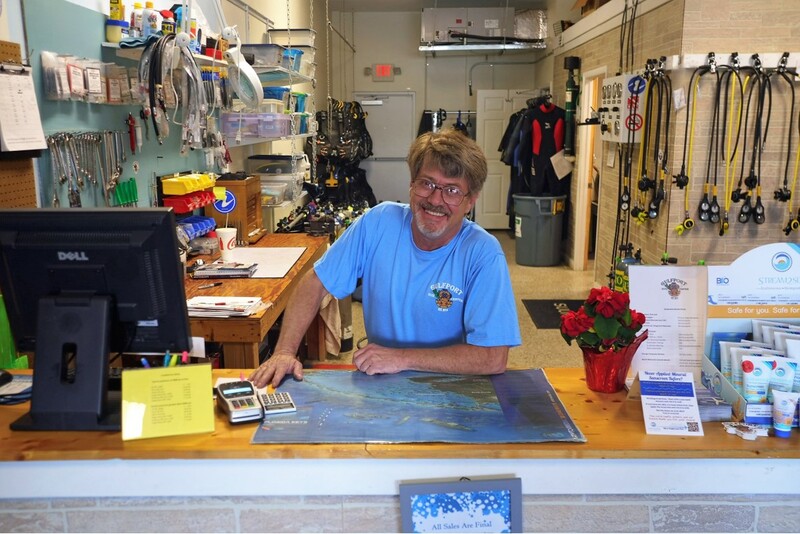 Their success is rooted in having friendly staff, being customer oriented, and providing their divers with what they need and want. Tucker cares about the experience his customers are having, and he knows that providing them with the right knowledge is key. As divers his customers need the right skills to be calm comfortable divers. He listens to what they are asking for, and then he provides the trips and the specialty classes, and whatever else is required. They send multiple representatives on each dive trip (they have 9 dive professionals), and they have their own dive boat (picture to the left), so they can give divers-in-training a real salt-water experience. For this, they go to some really beautiful spots such as Lake Denton, Rainbow River, and Devil's Den in Ocala. This exists alongside their 3 staff dive centre where they do a lot of their training. Their staff are all active dive professionals, and they have to be active in teaching and guiding as part of their certification. Each of the dive professionals is accredited with Scuba Schools International (SSI), and they have safety training, CPR, First Aid Training, and Defibrilator training. They are an SSI Diamond Training Centre, meaning that every year they are getting 200 people qualified with their Open Water Certificates, and 50 or 60 people through their continuing education. Tucker has also volunteered with Scubanauts, a non-profit that teaches teenagers to be scientific divers. He is very much oriented around helping more people in the future. He plans to double in size with a new building for the dive centre and wants to get 5 or 6 more dive professionals on board. They are very eco-friendly, provide ecology courses, and offer products that are non-hazardous to coral. Tucker brings his love of diving to his work, and he instils that same love in the people that he trains. With the number of people passing through the training every year that makes for a lot of well-trained divers passionate about diving. It's a great thing.